Although I arrived at Coombe Abbey on a bright winter’s day, on opening the imposing oak front door I was met with a Gothic interior that instantly reminded me of Dracula’s castle. With flickering lights and heavy furniture, I expected Christopher Lee to appear any moment to utter the immortal words, “I am Dracula and I welcome you to my home.” In fact that was the only thing missing. They’re not wrong to pronounce themselves “no ordinary hotel” – Coombe Abbey might just be the most eccentric venue in Britain, it’s certainly the most atmospheric place I’ve ever stayed. Even the elevator is wallpapered and opens onto long creaky corridors with red walls, making it extremely dark and somewhat sinister. 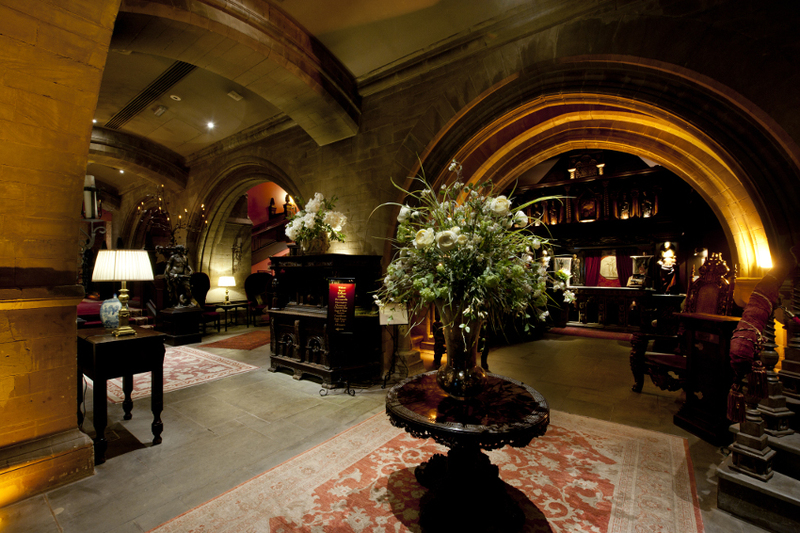 If you are of a nervous disposition, then, come nightfall, the corridors of Coombe Abbey is one place you won’t want to be alone. In the heart of the Warwickshire countryside, within easy distance of Stratford-Upon-Avon, Leamington Spa and Coventry, Coombe Abbey or the “Abbey of Cumbe” as it was once known, was founded in 1150AD by Cistercian Monks before becoming a royal property following the dissolution of the monasteries in the 16th century. Nor is it hard to imagine this grade I listed building being an important location for treasonous meetings between key figures of the gunpowder plot. 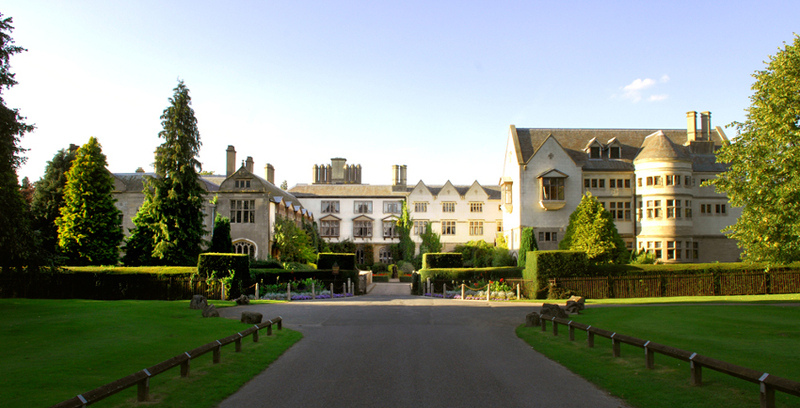 Several hundred years later in 1992, No Ordinary Hotels acquired the Abbey and opened it as a four star hotel, with the surrounding 500 acres of parkland, open to the public since the 1960s, continuing to welcome ramblers and nature lovers from far and wide. Our deluxe four poster “bedchamber”overlooked the lengthy driveway, Lady-of Shallot-style moat, and courtyard garden and featured an en suite containing a bath dressed with drapes, shiny burgundy tiles, and a Thomas Crapper-style toilet. Flourishes included a frilly toilet roll holder and hot water bottle, rather handy in a room as large and draughty as this. Tea and coffee making facilities could be found in a quirky pull-down wooden cabinet, but alas, no mini-bar, a failing most monks would surely have disapproved of. Whilst the décor might not be to everyone’s taste, I’m tired of staying in hotels void of character that have been decorated in “safe” muted colours their guests can’t possibly take offence to. 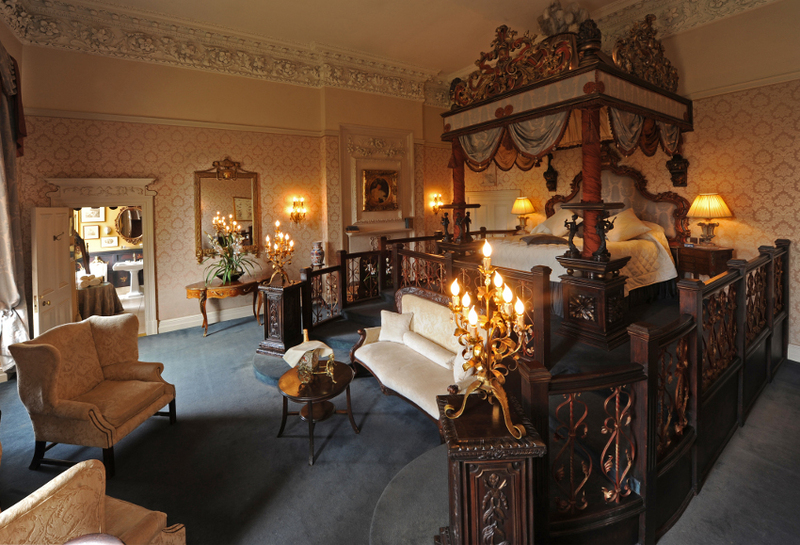 If you’re looking for a bit of escapism, Coombe Abbey is the answer to your prayers. From Bavarian Nights to Mediaeval Banquets, you need to check the hotel’s event listings if this isn’t something you’d like to witness let alone participate in. Or then again, you might want to let your blonde plaits down and embrace the sheer madness of it all. I was pleased to note no such frolics were taking place the weekend we visited and the Garden Room Restaurant, in a large conservatory that is a key feature of the modern extension, provided an inviting contrast to the rich furnishings of the lobby and our own bedroom. Light and airy, with comfortable wicker seats and tented corners perfect for two, the afternoon tea stands floating by looked delightfully dainty and was clearly a popular treat for weekend visitors to the hotel and a party who were in residence for a wedding the following day. After an afternoon shopping in Leamington Spa, M and I enjoyed smoked salmon sandwiches and pink fizz. Come the evening the restaurant had been transformed with the addition of crisp white tablecloths and low lighting. The food just wasn’t what I expected; modern and elegant, Chef Mark Constable clearly knows what he’s doing. Choose from either Table d’Hote (3 courses & coffee £34.50) or À La carte. I went off piste, starting with Atlantic prawn linguine with coconut and coriander cream, grilled king prawn and a crab and lemongrass-infused spring roll. Whilst the thought of partnering pasta with a spring roll made me fairly jolt back in my seat, the success of the dish had to be tasted to be believed. I only know that I’m not confident enough to attempt the combination at home and applaud any chef that can achieve something that flies in the face of culinary common sense. The rest of the menu was predominantly classic, and I was delighted with my Cornish lamb pave served with confit shoulder croquettes, roast baby parsnip, purple kale, salsa verde and lamb jus, as was M who ordered the special of guinea fowl served with a rich red wine jus and broad beans and purple sprouting broccoli. Our side of cauliflower cheese proved a delectable addition. The wine list was extensive without being of biblical proportions and the Babich Black Label Sauvignon Blanc, Malborough, New Zealand was a reasonably priced £25.95 and more than held its own against the robust flavours of the main course.